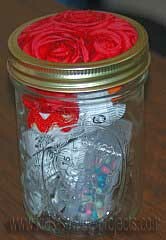 A basic sewing kit in a jar makes a great gift idea but it is something easy to put together for your own sewing needs. You can use a quart or a pint canning jar for this project. Cut out a circle from your material about 1 inch larger than your canning jar lid. You can cut out a pattern on a sheet of paper to get the right side if needed. Place batting between material and the canning lid. Press into jar lid and glue ends on the underside of the lid. Place sewing supplies in your jar and screw on lid. Some sewing supply ideas could be small scissors, a seam ripper, measuring tape, colored threads, a package of sewing needles and straight pins. Try making a mini pin cushion to match the jar lid. Want more Christmas jar ideas from this basic sewing kit in a jar?